Stan joined Ashfield Chess Club in 2004 when he moved to live in Kirby-in-Ashfield. He was known to our club before this as a tough opponent playing for the Long Eaton club. Stan was 73 when he joined Ashfield but was by far the most active player in our club. Over the Board he played regularly in congresses, club and county games. 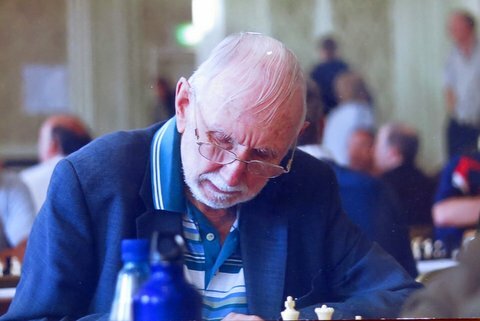 In 2006 he played in eight week-end tournaments He was also, uniquely in our club, a devotee of postal correspondence chess and typically at that time had 30-40 correspondence games on the go. Stan learnt to play chess at school when he was 11 and in 1942, he won a Junior County Scholarship, which gained him entrance to Owens Secondary School in Islington. Because of the war, the school had been evacuated to Bedford and it wasn’t too long before young Stan had joined the Bedford Chess Club, where he was the only junior in a man’s world. Returning to London after the war, Stan helped the school to win the London Secondary Schools Chess Championship in 1946. The final was played at the famous Gambit Chess Rooms in Budge Row, Cannon Street against Whitgift School of Croydon, who had Leonard Barden on Board 1. At the call of time Stan’s game was unfinished but Sir George Thomas, doing the adjudications, declared it a draw. In 1948 he joined the Metropolitan Chess Club who were then playing their games at St.Brides Institute off Fleet Street. He remembers there were approximately 30 boards that were never put away because they were used almost daily. Players such as Alexander, Winter and Penrose were regular attendees. Stan worked his way up to Board 2 for the club and remembers beating Stuart Reuben and Keith Richardson in OTB games, although he admits that Keith beat him many times in return. 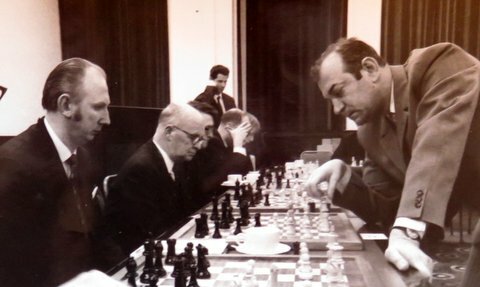 Stan won the Milner-Barry book award for achieving 9.5/11 in the London Chess League 1962 and was champion of the NatWest London region half a dozen times. 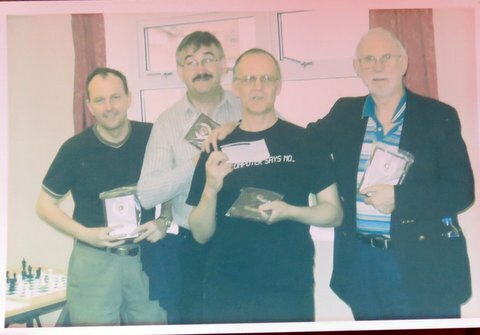 He played in the NatWest National Finals and represented NatWest in the National Inter-Bank Chess Championships on several occasions, which is where he first came to the notice of our members Andrew Toothill and Steve Burke in the 1980s as a doughty opponent and teammate. He drew with Dr. Fazekas (British Chess Champion 1957) in 1963 and his BCF grade was as high as 181 in the 1970s. Around this time he played in a simultaneous display against Victor Korchnoi. Stan’s sideboard is full of trophies but pride of place went to his British Championship triumph in 1998 when he won the U-150 section, no mean achievement for a man in his 68th year. With regard to postal chess, Stan first joined the Postal Chess Club (PCC) in 1947 and his first results appear in the February 1948 issue of Chess where he won two games in an Odds Tourney. Although interrupted by National Service and a period of illness, he worked his way up to the Championship section in the mid 1950’s. 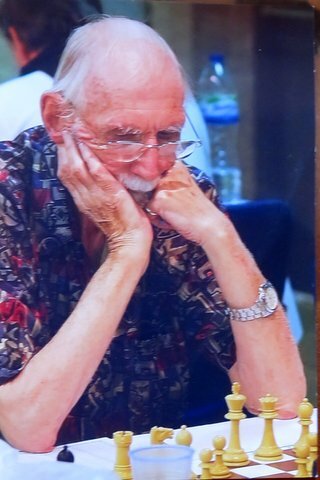 Stan primarily used postal chess as an experimental grounding for his openings and general practice between his OTB games. He won several trophies in the NCCC and seven RAF trophies. In 2013 Stan attained the title of Candidate Master from the BCCA. Stan’s correspondence play was not computer assisted. He was very methodical in keeping track of his games. He had 13 magnetic folded pocket boards, eight small wooden boards and various others on which he kept the position of his correspondence games. He drew a diagram every 15 moves and kept track of time diligently. His play was backed up by a library of over 350 chess books, mainly on a bewildering variety of openings. Stan’s standard of play remained remarkably solid and in 2012, his ECF Grade rose to 150. In the Notts League 2016-17 he scored 8 wins, 7 draws and just 2 losses - a 68% return. Stan was reliable and fiercely competitive, and always willing to pass on knowledge and advice to team-mates. He was the cornerstone of several team promotions and a win in the National Club U-150 competition. Despite the frailty, poor mobility, and occasional falls that marked his later years, Stan remained cheerful and uncomplaining to the end. Stan did have other interests outside of chess. He followed Tottenham Hotspurs and was interested in history and politics, being forthright in expressing his views. He used to enjoy travelling and several years ago travelled to New York, where he couldn’t resist visiting the famous Manhattan Chess Club. Stan’s last game was in December, 2017. A fall at home a few days later led to a hospital admission. He was rehabilitating at Sutton Court before he contracted a chest infection that developed into pneumonia and caused his death. Prior to this, Stan was eagerly looking forward to returning home to read the chess books (chosen by Stan) which were his Christmas present from his step-daughter. He was an exceptional student of chess, and inspirational chess player, whose results defied his years and physical health problems. Stan leaves a son and two daughters from his first marriage. His chess pals and colleagues would want to extend our condolences to his family. *We would also like to thank Neil Limbert of the BCCA whose article “The ’Evergreen’ Stan Cranmer”, BCCA, Summer, 2007, informs this notice. This also gives four of Stan’s games including this 2004 game against another Notts stalwart. 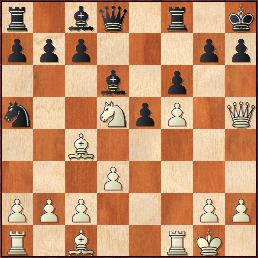 1.e4 e5 2.Nc3 Nc6 3.Bc4 Nf6 4.d3 Bb4 5.Nge2 d5 6.exd5 Nxd5 7.0-0 Nxc3 8.Nxc3 0-0 9.Nd5 Bd6 10.Qh5 Kh8 11.f4!? f6 12.f5 Na5?? 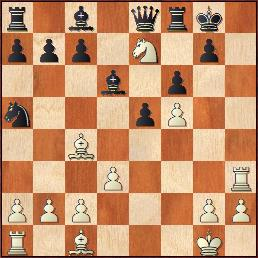 This natural looking attack on white's bishop turns out to be a blunder, but Stan had to find the only moves to prove it.